Feed your passions, and let your fears starve. Bad news: the Food for Four website seems to be down. Good news: I have my version of the recipe here. This isn’t the first time I’ve used this recipe, and thank you again Food for Four for another spot on recipe. 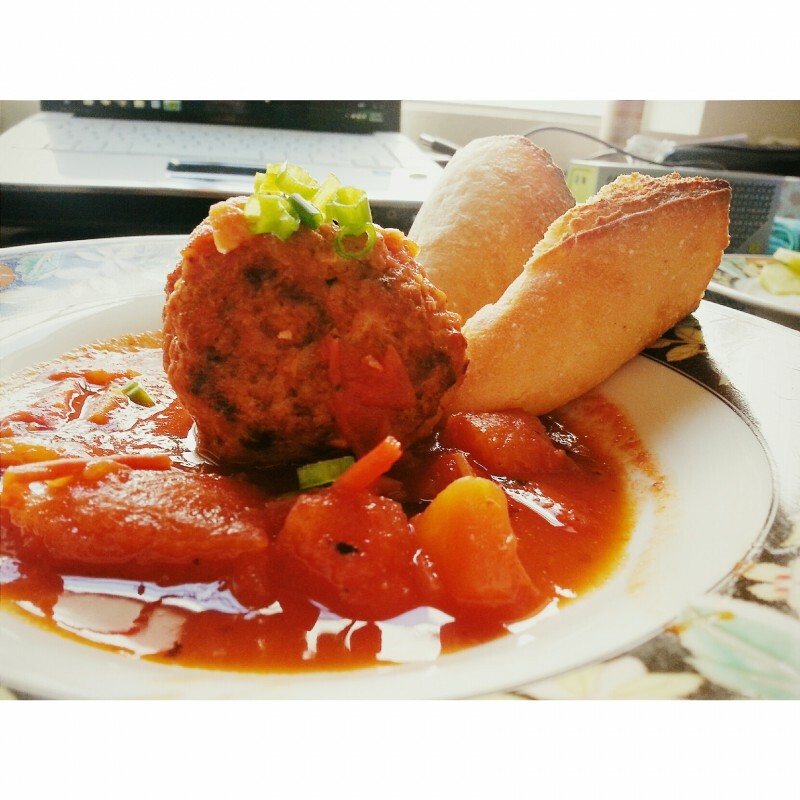 Xiu mai is a traditional Vietnamese meatball, and unlike other culture’s meatballs ours are HUGE. So our meatball sandwiches aren’t sad like some meatball sandwiches where the meat to sauce ratio leans to the sauce. We do it right. XIU MAI! GO MEAT! Xiu mai is also the name of some pork dumplings that you usually see at the dim sum joints…don’t be mistaken. The first couple times I made the recipe I followed it word for word and it turned out just like how my mom makes it. This time there were a few changes since the grocery store I went to only had ultra lean pork…seriously? If you go to an asian market there is only one choice of ground pork also but it’s fatty, the one from Albertsons was….LEEEEAAAAAAN. Brilliant me, I mixed the ultra lean pork with lean ground turkey…what was I thinking? Thinking healthy maybe. WHAT IS HAPPENING TO ME?! 1 small can water chestnut (220g) or 1 jicama, cut into very small pieces (I used jicama, remember to peel it and cube it. In a large bowl, combine meat, garlic, shallots, green onions, water chestnuts or jicama, egg, sugar, salt, fish sauce and pepper, and mix well with your hands. Form the mixture into 4 cm balls then place them on a tray. 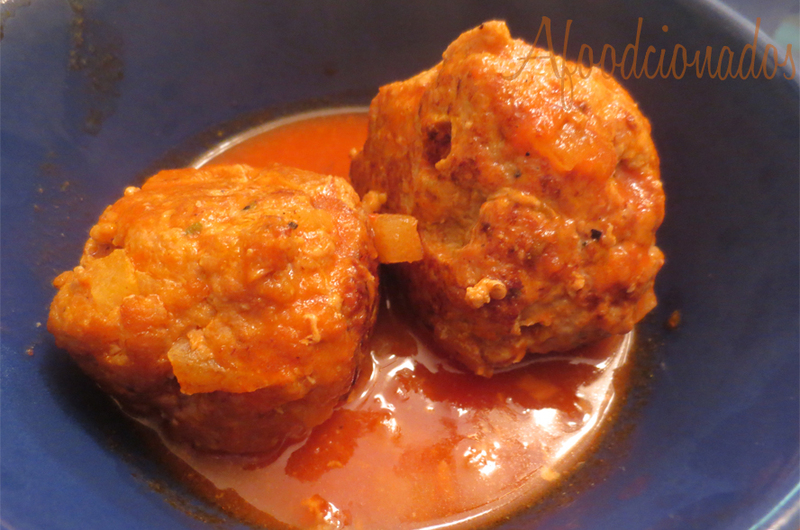 I made them about tennis ball size, so they are large enough and keep their shape when you sear/simmer them. Heat up a frying pan, add oil and pan fry the meatballs so that they are brown and charred. They do not need to be fully cooked as doing this will keep their shape. Once they are brown, remove from the pan and place on separate plate. If they’re falling apart, cook it some more so you’ll be sure you’ll hold up when they get into the meatball hot tub. In a large heavy based saucepan, heat a small amount of oil then add the chopped garlic and fry until fragrant. Add the chopped tomatoes and bring to the boil. Add the tomato paste stir until the color is a darker red. Add water, fish sauce, sugar, salt and pepper. 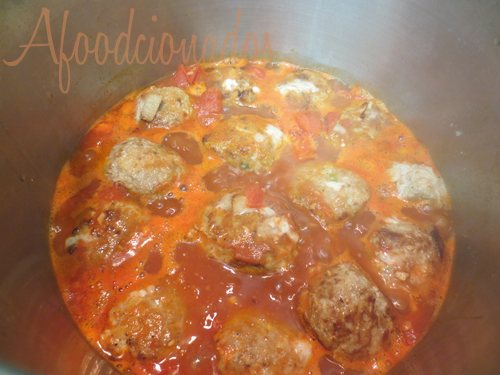 Simmer the meatballs for about 25 minutes or until cooked and sauce is reduced. Taste test and add more seasoning if required. Remove from heat.